Facebook is the fastest growing social networking application that currently has more than 350 million active users. 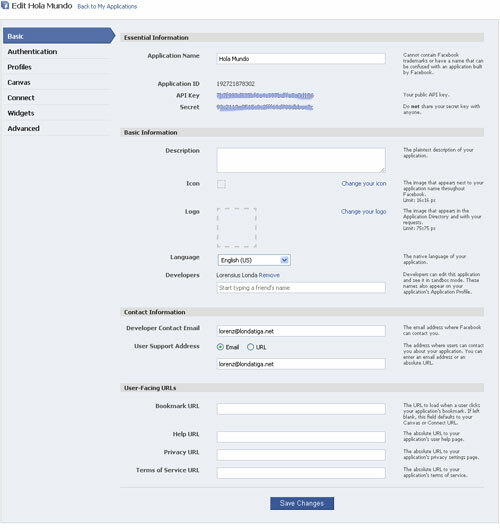 One of it’s key features is Facebook Platform, that enable us to build applications on Facebook. Currently there are a lot of Facebook applications built by developers around the world such as game, which is the most popular application on Facebook. If you have meet the requirements above, you are ready to get started building Facebook application through this tutorial. Then Facebook will create two keys for your application, the API key and the secret key, write them and save on a file for later use. Go to Canvas tab and type a unique URL for your application (hollamundo) on Canvas Page URL, it must be unique or you’ll get error message if the URL has been used by another application. In this case i use hollamundo rather than holamundo because it has been used by another application. On Canvas Callback URL, type the URL for the application page on your server . 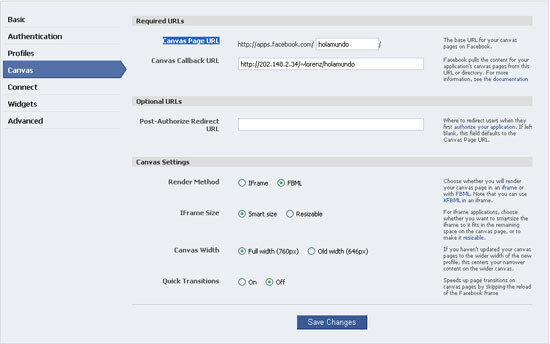 Choose FBML On Render Method option under Canvas Settings, which enables you to build full Facebook Platform applications that deeply integrate into a user’s Facebook experience. Let another setting options to it’s default then click Save Changes button. At this time your application is ready, try to type your Canvas Page URL on browser and see what the results. What you get is an error message because your application doesn’t exists on your server, ok don’t worry, lets go to next steps. After configuring your application on Facebook, it’s time to do a little bit coding and some server administration tasks. Download Facebook Client Library and extract it, you will find two directories inside, footprints and php. Copy all files from php directory and upload them to your facebook application directory on your server, that must be the same with Canvas Callback URL you set before. $fbml      = "<h2>Hello world, my name is <fb:name uid=\"$myuid\" useyou=\"false\" />,"
Simple right ? Facebook has made it simple using FBML, all you have to do is apply the predifined tags on your code. You can read the complete explanation about FBML on Facebook Developers Wiki page here . line 8: get your facebook user id (uid), the require_login method is used to force user to logged into Facebook before using the application. If they are not logged in, Facebook will redirect them to Facebook login page first and then brings them to your application page after they logged in. line 9: your page content’s that display your name using FBML Fb:name tag. Now your application is complete and ready to be accessed by anyone in the world. Type your Canvas Page URL on browser and you’ll get Allow Access page which is default for Facebook application for the first time access, click Allow button to access your application. Great tutorial, however I did not work for me. I created a directory in my website http://www.trendspot.ie. I created the index.php file and dragged it into the my new ‘facebook’ directory along with the the php files in the facebook client library. I did this using FTP. The requested URL /facebook/ was not found on this server. I don’t know what I’m doing wrong and I hope you could help! Have you tried to directly access the ‘http://www.trendspot.ie/facebook’ ? was it work ? i understand that i can’t use localhost for my application and neither do i have a webhost. I saw that you use some ip address for the callback url. can you help me with these cuase i think that is my main problem to display my application on facebook..help me please. Very nice tutorial!. Thank you very much. Nice tutorial. Like that. I am facing 1 problem now. Redirection Problem. When I hit the Url of my app then it start infinite redirection url. I think the token is not getting verified. Please let me know how can I resolve this?? Quick question, it looks like I could just add the rest of my php script under the code facebook provides, so in other words if i had a stand alone php script I could easly turn it into a facebook app. I this right what I am understanding? I am facing some unique problem in fb app. We have installed lamp server on new server and copied all files in that new server, keeping all root directories and folder positions to be same and also changed all pointing to new servers. Thank you for this guide. We will insert this facebook login on our rating and review site. It works already on our test-site. The only thing we could not manage is to replace the text “login with facebook” with the login button of facebook. Any idea how to solve that problem? Thank you. A very simple how to guide for beginners.